Following is a list of general terms commonly used when describing wines or wine making. Indented under the major terms are words commonly used to describe the varied characteristics of that term. For many of these there is a wide variability in their use; however when we describe wines in our reviews these are the definitions we use. Acetic: Wine with an unpleasant, sharp, vinegar-like smell and taste. A wine becomes acetic as a result of the presence of acetobacter, a bacteria that causes the natrual conversion of wine to vinegar. Acidity: All wines contain some acids and young wines are generally more acidic than older ones; however, improperly balanced wines may taste acidic or sour because of an abnormally high acid content. Astringent – A wine with aggressive acidity and tannins. Bright – A wine with pronounced acidity. Crisp – A white wine with refreshing fresh flavor and good acidity. Delicate – A wine that may have heightened acidity, but light on tannins and fruit. Edgy – A richer wine with high acidity. Flabby – A wine with very low acidity. Flat – A wine with no acidity. 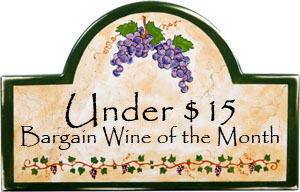 Fresh – A wine with moderate acidity, often used to describe young wines. Lively – A lighter red or white wine with noticeable acidity. Racy – A wine with bracing acidity. Sharp or harsh – An unpleasant wine where the acidity is out of balance of the tannins. Soft – A wine with less strong tasting acidity. Tart – A wine that tastes sour due to acidity and or yeast. Zesty – A lighter wine with noticeable acidity. Zippy – A lighter wine with very noticeable acidity. Alcohol: A natural product of fermentation when yeasts convert the sugar in grapes to alcohol and carbon dioxide. Burn – When the alcohol “burns” the back of your throat. Hot – A wine that has high alcohol. Appellation: In general use the word simply means the place where the grapes were grown and made into wine. However, almost all wine producing countries have legally identified geographical areas (Appellations) that restrict wine production, such as grape varieties that may be grown, blending constraints, maximum grape yields, alcohol level, and other quality factors. If these restrictions are followed the appellation name may legally appear on a wine bottle label. The appellations laws for each country vary dramatically. For example, the United States AVA or American Viticultural Area only restriction for using the AVA name on the label is that 85% of the wine must have come from grapes grown within that AVA geographical boundary or if the appellation is a state, 100% of the grapes must come from the specific state; however, the French AOC or Appellation d’Origine Contrôlée regulates not only wine but also the label. There are four main categories in the classification of French wine, each with different restrictions. Vin de table or “table wine” and includes any wine made anywhere in France. These are the unassuming, every-day drinking wines that are known for their affordability, but the label cannot list the year of production, grape varieties, or area where the vines were grown and wine produced. Vin de pays This means “country wine” and the bottle label identifys the region where it was produced. This AOC subdivision has easily met standards for grape variety, alcohol, acidity, Sulfur levels, yield and can display their vintage on the label. VDQS This stands for Vin Delimité de Qualité Supérieure, “wine determined as of a superior quality” compared to vin de table or vin de pays. Only about two percent of French wines are in this category and those with this designation are generally thought to be wines from vin de pays areas which are seeking to become a full AOC. Vin d’Appellation d’Origine Controlée This is the top designation of the appellation system. The label is a guarantee of origin and quality. The wines of each AOC are supposed to have a distinct and consistent character and only an area which can produce distinctive wines should qualify for AOC status. Wines with this designation are subject to stricter controls that include: permitted grape varieties, and the ratios in which they can be blended; maximum yields; vine age and planting density; harvesting and vinification techniques and level of alcohol in the finished wine. Aroma: The smell of a wine, often used interchangeably with bouquet. The term is generally applied to the fruit-based impressions of a young wine, while bouquet is reserved for more aged wines. Balanced: A wine in which all its components (acidity, alcohol, fruit, tannins, sugar, extract, and other characteristics) are in harmony, and none masks the other. Body: The weighty feeling in the mouth due to the wines alcoholic content and its extracts. 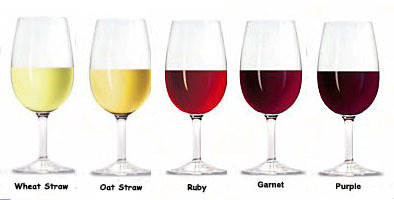 Wines are considered light, medium, or full-bodied. Austere – A wine that’s hard to drink. Complex – A wine that keeps on delivering more interesting flavors. Concentrated – A wine with bold fruit flavors, moderate acidity and tannins. Delicate – A wine that is faintly bodied. Full-bodied – A big bold flavored wine that has pronounced weight on the palate. Light-bodied – A wine that is light on the palate. Mellow – A wine without major intensity. Opulent – A bold wine with smooth tannins and lower acidity. Polished – A wine that tastes clean and well made. Powerful – A big wine with high intensity. Rich – A wine saturated with fruit flavors. Robust – A full bodied wine with strong and pronounced flavors. Thin – A wine that has acidity but little substance. Brettanomyces (Brett): A rogue yeast that can affect the taste and smell of wine. It is very difficult to get rid of once it has infected the wine making surfaces. The odors range from a barnyard to band-aids. In small amounts, however, these smells can add interest to the wine. Color: The color of a wine can reveal information about its style and age. Generally a pale white wine will be fairly light, dry, and dominated by fruit or floral characteristics. A more intensely-yellow with golden or amber hues, will be richer with oak and spices from bottle aging. A light-colored red wine generally has less tannins, body and alcohol content than dark wines. Our reviews generally use variations of the five colors shown here. Complex: A wine that is multi-layered in flavors and aromas. Each sip brings another flavor and reveals another nuance. Good wines are usually complex, great wines even more so. Corked: A wine that smells like a wet dog or wet cardboard because bacteria in the cork interacted with minute amounts of chemical residues that remained when the bottles were cleaned. Corked wine has both a defective aroma and flavor. Dry: A wine that has little or no perception of sweetness. Earthy: Wine with aromas and flavor reminiscent of damp soil or a forest floor. This is a positive attribute and the reflection of all the effects the local environment had on the production of the wine. Finish: The impression (or aftertaste), long or short, strong or weak, that lingers after you have swallowed a wine. Floral: Aromas and flavors, usually in white wines, that are reminiscent of flowers. Citrus Blossom – Both an aroma and flavor found in white wines. Geranium – An aroma generally associated with improper winemaking. Lavender – A resinous floral aroma common in red wines. Perfumed – A highly aromatic wine, typically used to describe white wine. Rose – A positive floral aroma found in both red and white wines. Violet – An aroma associated with fine red wines like Cabernet Sauvignon. White Flowers – Lily, apple blossom and gardenia, usually found in aromatic white wines. Fruity: The term for the pronounced aroma or flavor that comes from the wine grapes themselves. Apple – Aroma or flavor of apple commonly found in white wine. Berry – Aromas or flavors of strawberry, raspberry, cherry, blueberry or blackberry. Citrus – Aromas or flavors of lime, lemon, orange, grapefruit or citrus zest. Dark Fruit – Full bodied red wines generally have more dark fruit flavors. Extracted – Wine that is darker and richer than other wine made from the same grape. Flamboyant – a wine that has very showy fruit flavors. Fleshy – A wine that tastes fruity and meaty at the same time. Grapey – A wine that tastes more like grape juice. Jammy – the fruit flavors in the wine taste like jam. Juicy – Young wines that are fruity and less complex. Melon – Aromas or flavors that are juicy and sweet; Cantaloupe, honeydew melon. Plummy – A red wine with fresh plum flavors. Red Fruit – Generally red fruit flavors indicate a lighter bodied wine. Stone Fruit – Aromas or flavors of apricot, nectarine, peach or pear. Tropical Fruit – Aromas and flavors of Banana, pineapple, lychee or coconut. Herbal: The term used to describe wine aromas or flavors reminiscent of herbs or vegetative smells. Asparagus – A cooked aroma on white wines. Bell Pepper – Aromas associated with a chemical compound group called pyrazines. Cat’s Pee – A tart acidic aroma that smells like Boxwood or cat urine. Eucalyptus – A mint-like resinous smell usually in Australian wines. Gooseberry – Sweet herbal aroma and flavor found in Sauvignon Blanc. Grassy – The smell of fresh cut grass. Green – The smell known as Herbaceous or leaf-like. Quince – A green and tart fruit flavor with astringent qualities. Sage – A resinous and flowery smell, usually in red wine. Stemmy (or Stalky) – A negative bitter note usually on the finish. Vegetal – An earthy quality on the finish of red wine. Diesel – A strong gasoline smell. Graphite – Smells like pencil lead, often found in fine red wines. Minerality – An undefinable rock-like character to wine with flavors other than fruit. Oily – A textural description for a wine that sticks like oil in your mouth. Plastic – A positive characteristic in fine aged Riesling. Rubber – A moderately strong resinous aroma found in both red and white wines. Tar – A very strong burnt, resinous smell in earthy full-bodied wines. Wet Asphalt – A wet rock aroma found in white usually in wines with moderate acidity. Lees: The remnants of yeast cells that settle to the botom of the container after fermentation is complete. Leaving the fermented wine in contact with its lees (Sur Lie), rather than removing the lees right away, often adds complexity and nuance to the wine. Legs: The tracks of liquid that cling to the sides of a glass after the contents have been swirled. A more viscous wine (fuller body) will create thicker, more slowly flowing legs as it descends along the glass. It is also said to be related to the alcohol content of a wine. Legs are also called tears. Meritage: A red Meritage must be made from a blend of at least two of the following varieties: Cabernet Sauvignon, Merlot, Cabernet Franc, Malbec, Petit Verdot or Carmenère, with no varietal comprising more than 90% of the blend and a white Meritage must be made from a blend of at least two or more of the following varieties: Sauvignon Blanc, Sémillon or Muscadelle du Bordelais, with no varietal comprising more than 90% of the blend. To use the term Meritage, wine makers must license the Meritage trademark from its owner, the California-based Meritage Alliance that sets the standards for the Bordeaux-style blends. Non-Vintage Wine: A wine containing juice from grapes harvested over several years instead of just one. Nose: A term used for the general smell or aroma of a wine. Oak: The term used to describe the smells and flavors found in wines that have been aged in small oak barrels. Buttery – A rich, creamy smell and flavor reminiscent of butter in white wines matured in oak barrels. Caramel – A sweet aroma from aging wine in toasted oak barrels. Charcoal – A flavor commonly associated with red Bordeaux. Clove – a complex oak aroma often found in European oak. Creamy – Similar to “Buttery” but is a texture due to Malolactic Fermentation. Dill – An herbaceous oak aroma commonly associated with American oak barrels. Nutty – a flavor that develops with long term aging in barrels. Smoky – An aroma or flavor usually associated with using highly toasted oak barrels. Spicy – Spices like clove, allspice, and nutmeg commonly associated with oak aging. 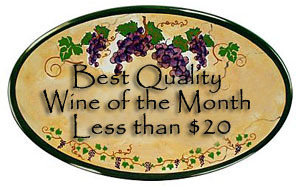 Toasty – A positive description for highly oaked wines. Tobacco – A sweet resinous smell and flavor on the finished of an oaked wine. Vanilla – A flavor compound that comes from primarily from new oak barrels. Orange Wine: Orange wine is simply wine from any white varietal that is produced with extended skin contact. The name refers to the peculiar hues of orange color the wine develops. Orange wine’s method of fermentation dates back centuries, born from the need for a natural preservative. This process creates sulfides that protect wine from oxidation. The process also has a strong effect on the taste because the skin contact allows the wine to absorb characteristics from the skin—tannins, complex flavor compounds, color, and terroir. Oxidized: A wine that has experienced to much exposure to oxidation, considered faulty, and may exhibit sherry-like odors. Sommelier: The French term for a wine steward. Spicy: A wine with an aroma or flavor suggestive of aromatic spices. Musky – An intense animalistic sweaty spice flavor. Bright – A wine with moderate acidity perceived as spicy. Pepper – the taste of pepper from the grape variety. Anise – A variety characteristic of licorice. Clove – A sweet woodsy flavor often attributed to oak aging. Cinnamon – A sweet spice noted in lighter bodied oak-aged red wines. Nutmeg – Found in oak-aged reds and vintage sparkling wine. Saffron – An aroma from noble-rot in white wine such as semillon. Ginger – An aroma,sometimes from noble-rot found in white wines. Style: An overall characteristic of the wine. Accessible – A wine that is easily appreciated by a large number of wine drinkers. Clean – a wine that doesn’t have earthy or rustic flavors. Delicate – a wine that is faintly flavored. Refined – a wine that tastes very clean. Sweet: A wine with a noticeable sense of sugar. A sweet wine retains some sugar after fermentation has ended. Tannic: A wine with abundant tannins. Tannins: Chemicals found in the seeds and skins of grapes, especially reds. It is a bitter-tasting material which adds structure to red wine. Tannins can also be astringent if they are not balanced by fruit. Astringent – The dry, puckering effect on the inside of the mouth due to an overly tannic wine. Bitter – Unpleasant taste typically caused by an excess of tannins in the wine. Chewy – A tannin that makes you want to chew it because it’s chunky and viscous to chew. Coarse – Tannins with a choppy grit like course sandpaper. Firm – Persistent fine grained tannins. Flabby – Lack of tannins makes wine taste weak. Grippy – Tannins that sticks to the sides of your mouth. Harsh – A derogatory term used to describe a wine that has unbalanced tannins and acidity. Leathery – Delicate but earthy tannins often found in older wines. Powerful – Big strong tannins. Rigid – Aggressive tannins in the front of your mouth. Round – Smooth tannins with no bite. Structured – Well integrated but persistent fine-grained tannins. Silky – Fine-grained ultra smooth tannins with very little bite. Soft – Lower concentration or mild tannins. Supple – A wine that is both vigorous and smooth with well integrated tannins. Terroir: The complete natural environment in which a particular wine is produced, including factors such as the soil, topography, and climate. Texture: The overall mouth-feel of wine on the palate. Terms such as coarse, rough, smooth, velvety and silky are frequently used to describe specific textures of wine; however, we also use a non-traditional term “grit” to describe the overall textural mouth-feel of the wine. We quantify this term using a range of sandpaper grit everyone can easily recognize, e.g. : very course 60-grit (large salt crystals on pretzels) to very fine 2000-grit (silky smooth whipping cream). We have found it a very useful way of accurately differentiating the textural mouth-feel of wines. Yeast: A single-celled fungi used for fermenting wine. Biscuit – A taste found in aged sparkling wines as yeast breaks down over time. Buttery – The textural oily feeling in a white wine that is caused by Malolactic Fermentation. Cheesy – Mostly a white wine aroma that adds a savory character. Creamy – A taste in red and some white wines due to Malolactic Fermentation. Sour – A taste sensation similar to sour cream due to yeast flavors.